Solar Panel Quality – You can get expensive (overrated in my opinion) German made solar panels, or like 95% of people getting Solar Power in Australia, use China made panels. Your installer – we have seen it all when it comes to solar power quotes, and it’s quite often that one installer can over-quote by $Thousands while using the same level of quality of inverter and panels as everyone else. So ensure you get 3 quotes from 3Quick Quotes and make the Installers compete for your business. On average a 1.5kW system fully installed SHOULD cost $2,000-$3,000 (after the rebate has been factored in). How Much will I Save on my Electricity Bills? This will depend on where you live (i.e. the amount of sunlight there) and also the system size you have. As a general rule a 1.5kW system installed in NSW can save you $100-$150 per Quarter on your electricity bills. Therefore Solar is definitely a worthwhile investment. As you go up in system size, the savings will also go up. Is there a Government Rebate for Solar and if so How Much? Yes there is a solar power rebate, it is known as the Solar credits scheme (among other names) and involves the signing over of Small-scale Technology Certificates (STCs) to YOU the home owner or in most cases the installer of your system, who usually prices in the rebate into the supply and install of your system. The amount of the Government rebate varies through the Country depending in which Zone you reside (there is 4 Zones). But as mentioned previously your Solar Installer should explain the rebate and they will price the rebate into your quote. How Many Solar Panels will I need on My Roof? One of the deterrents of people getting Solar Electricity is the panels that have to go on top of your house’s roof, so how many panels do you need on your roof? This depends on the Watts in each panel and the Size your system – Example: If you are getting a 1.5kW system and the Panels that your solar power company uses are 200W, then you will need 8 panels – because 8 x 220W = 1,600W. So the more wattage your panels have – the less you will need on your roof. What Steps Do I need to Take to Get Solar Energy? 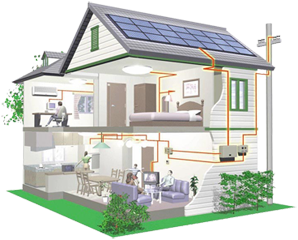 1) Choose your system size – the minimum system size is 1.5kW – this will save you $100-$200 per quarter on your Electricity bills. Other options are 2kW, 3kW and so on – you can even get 10kW. But a 5 kW would probably be enough for most family homes to completely cover their Electricity bills (not many people get 5kW systems as they cost $10k++). 2) Use this website to get 3 quick quotes from local providers in your area. 3) Get it Installed – Once you sign up with a local installer, the installer will install two main components – photovoltaic panels on your roof and an Inverter on the side of your house. Once the system is installed you will then pay the installer and sign over the STC credits (rebate) to them. 5) Electricity Company – Notify your electricity supplier of the connection of your new system.